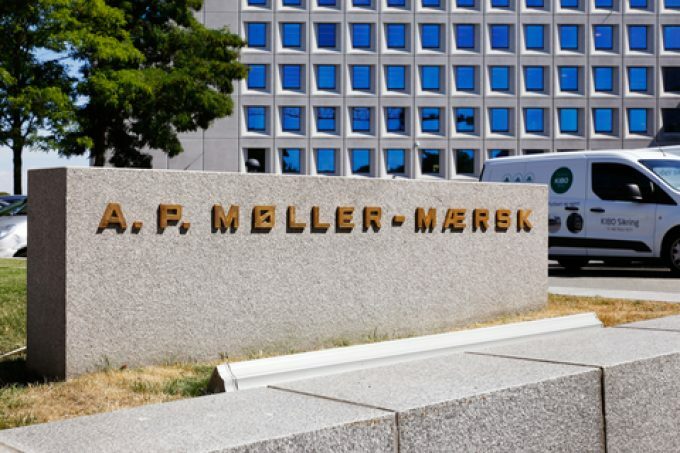 AP Møller Maersk saw “a quarter of solid growth on the top line” and an underlying profit of $251m in Q3, and a cumulative positive of $100m for the nine-month period. Group CEO Soren Skou said this morning the result represented “solid progress in our transformation”, adding that Q4 would be “very, very similar” ensuring “good momentum going into 2019”. Compared with the same quarter of last year, impacted negatively by a cyber attack on its IT systems and which did not include Hamburg Süd, turnover was up by 31% to $10.1bn. 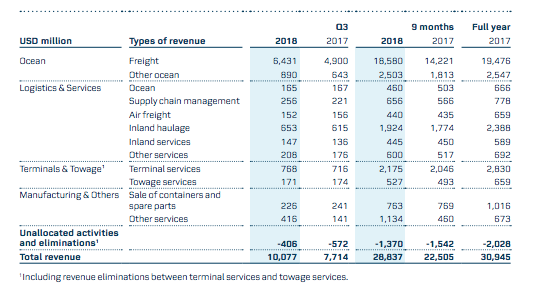 On a like-for-like basis, excluding Hamburg Süd, ocean and terminal revenue each increased by 7%, while the logistics and services sector was 8% ahead. Volumes carried on Maersk’s container line vessels jumped by 27% on the same period of last year, to 6.6m teu. This included Hamburg Süd cargo, which boosted north-south liftings by 24% and intra-regional carryings by 65%. And Maersk Line’s traditional east-west routes also performed well, increasing by 14% year on year. The average freight rate across its tradelanes improved by 5.5% to $1,929, due to a “tighter supply-demand balance”, an increase in the collection of demurrage and detention charges and the impact of the introduction of an emergency bunker surcharge (EBS) at the end of June. Revenue from its ocean segment of container line business increased by 32% to $7.3bn for an ebitda of $925m. During the quarter Hamburg Süd contributed with liftings of 1.4m teu and a pro-forma ebitda of $148m. During the company’s earnings call today, Vincent Clerc, chief commercial officer of Maersk Line, said Hamburg Süd had “done a fantastic job in retaining business” following the takeover, and was confident about the new round of contract negotiations in the coming months. Maersk has now upgraded its annual synergies from the merger to $500m, from the previous $350m, with $400m coming through this year. Asked why the 2M had decided to reintroduce the suspended AE2/Swan Asia-North Europe loop next month, Mr Clerc said it was in response to a “rebound” in cargo forecasts ahead of the Chinese New Year (CNY) holiday in February. However, Mr Clerc added that the 2M could withdraw the loop again after the holiday if demand weakened. On the transpacific, Mr Clerc said he expected to see a “significant slowdown in demand in January”, after the introduction of wide-ranging 25% US import tariffs on Chinese goods, “while everybody tries to figure out their new supply chains”. To overcome the slump in demand, Maersk will take out some capacity, but “being underweight on the transpacific is an advantage,” said Mr Clerc. Maersk Line’s chief operating officer, Soren Toft, said the merger with Hamburg Süd had resulted in some 50 chartered ships being returned to owners, taking the combined fleet down to 723 vessels for a capacity of 4m teu, against 4.1m teu at the time of the acquisition. Maersk has set aside capex of $80m for investment in scrubber technology on its ships, which would equate to installation on some eight vessels. “Scrubbers are not a discussion we have had with customers,” said Mr Clerc, adding “[to comply with IMO 2020] the vast majority of our ships will consume low-sulphur fuel”. He explained that scrubbers would not have any influence on its new bunker surcharge proposals. 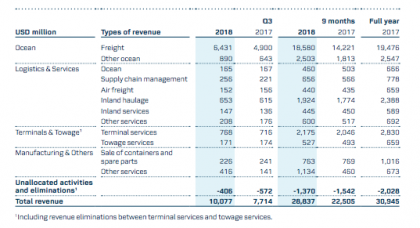 The terminals and towage sector, which includes APM Terminals and towage company Svitzer, saw turnover up 4.7% to $932m in Q3. 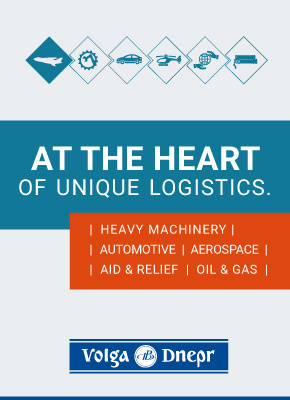 APMT contributed revenue of $768m, 7% higher than the same period last year. Throughput at APMT’s portfolio of terminals increased by 7.5% year on year to 4.3m teu. During the quarter, APMT succeeded in winning four new contracts with external customers adding 200,000 moves on an annual basis. In the logistics and services sector, which includes forwarding arm Damco and APMT inland services and intermodal activities, revenue was up 7.5% to $1.58bn, to give an ebitda of $48m ($28m). From 1 January, digital freight forwarder Twill will move from Damco to Maersk, which Mr Clerc said would enable Damco to concentrate its “full focus on freight forwarding” and “manage its costs more aggressively”. For the full results, please go here. For more analysis on APMM, try Loadstar Premium.